The chemicals and industrial sector features complex plants, with unclear situations and surroundings. This is often combined with the presence of hazardous substances. Despite the specific regulations, activities in the chemicals and industrial sectors are often associated with major risks. 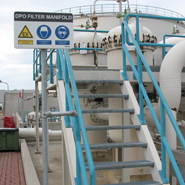 Blomsma Signs & Safety focuses on reducing risk levels by effective use of safety signage. For designing and implementing such signage, our motto is ‘Fit for Purpose’. 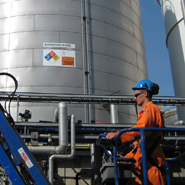 We obtain a picture of the approach to safety that is required on the site, from the site access through to the plant equipment and the factories. We translate safety policy and visualize safety from it. Using the right materials and the correct interpretation of legislation and regulations and the supporting standards is an essential part of this. We already have many years of experience with a wide range of customers. You will find us everywhere – tanker terminals, refineries, mining installations, water purification plants, chemical plants, food processing factories and construction companies. The Industry and Chemicals portfolio visualizes how our experience and branch specific knowledge translate into the quality of our projects.